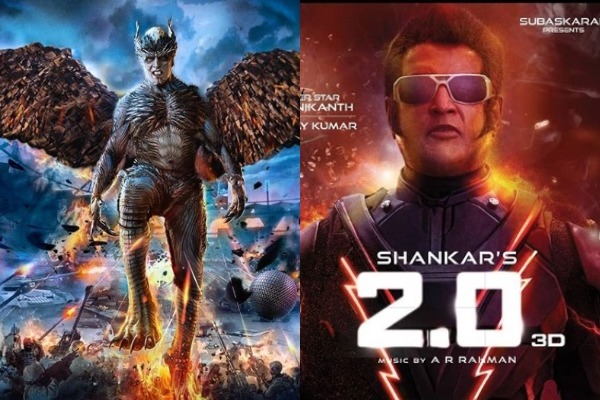 Plot When an unknown fifth force has started terminating cellular technology and begun attacking the city, Dr. Vasigaran brings back his robot Chitti, renaming him 2.0, to help him end the catastrophe that has presented itself on Chennai, in the form of an enormous bird. So, does birdman succeed in overpowering Chitti 2.0? Rajinikanth is a superstar and there’s no doubt about it. Any movie he appears in automatically becomes a money-spinner at the box office, pulling in a large number of audiences on the first day itself. Even if the star’s antics defy all the laws of physics and his action sequences defy gravity, his films do tend to send cash registers ringing every time. Director S. Shankar, who last collaborated with Rajinikanth in the 2010 release ‘Robot’, returns eight years later with its sequel, which might not be as good as its predecessor, but it might still appeal to the masses. As the camera begins rolling, an elderly man is seen leaping to his death from a tall cell phone tower. Nobody knows who he is until all of Chennai is in distress due to a strange-looking bird that has begun attacking people in the city. Cellular phones are being snatched away by an unseen force and mobile towers are being uprooted across Chennai. The government immediately contacts Dr. Vasigaran (Rajinikanth) to seek his help in unfolding the mystery that has gripped the entire population of the city. Dr. Vasi soon finds out that the odd avian is a huge crow made out of mobile phones, which has been trying to bring the technically-advanced city to its knees. It is time for him to bring back the now dismantled robot Chitti (Rajinikanth) into action to help him in ending the city’s crisis-like situation. His petite humanoid assistant Nila (Amy Jackson) lends him her support and Dr. Vasi comes face-to-face with a bizarre phenomenon. Badhaai Ho Movie Review[3/5]: Ayushmann Khurranaa and Neena Gupta’s Family Deserves All The Badhaais! A fifth force, calling itself Pakshi Raja (Akshay Kumar) is at the root of all evils, which has been at the receiving end of the advancement of technology since ages. As Dr. Vasi, Nila and Chitti – now calling itself 2.0 Reloaded – delve deeper into Pakshi Raja’s background, they unearth an ageing ornithologist’s past and a bigger social problem that has gripped not just humans but other forms of living beings too. How the talented Dr. Vasi, the wisecracking Nila and the super intelligent 2.0 solve Pakshi Raja’s problems and end it for him is for the audiences to find out, although it becomes way too predictable even before the intermission comes along. ‘2.0’ is nothing but a social drama with a strong message, which has been packaged in the best of VFXs and CGIs to make it more acceptable. It wins no doubt, but the premise is too flimsy and conventional, which does not add to the spectacular movie-watching experience. For how long can one only keep looking at visual effects and the mindboggling action that unfold on the screen? There needs to be a strong storyline to keep everything glued together, which sadly is missing in Shankar’s ‘2.0’. Rajinikanth is unmatched as both the scientist Dr. Vasigaran and his new and advanced robot Chitti 2.0. He breathes life into the lifeless humanoid and keeps his audiences spellbound. However, in some scenes, the computer-generated images of the superstar might bring on the cringe. Amy Jackson as the robot assistant is as lifeless as her reel-life character on the screen. She does not emote well nor does she shine in the so-called romantic scenes. She has truly given a ‘robotic’ performance in the true sense of the word! Akshay Kumar as the antagonist stands tall opposite Rajinikanth in every face-off scene and his foray into Southern cinema might just prove lucky for him. Although his make-up appears a bit botched sometimes and his avatar, a little repulsive, his acting talent overshadows all the negatives that have marred his role. Pakshi Raja is 2.0’s nemesis and Akshay Kumar proves it strongly with his skills. Before the interval, the plot becomes predictable and it’s a child’s guess why the antagonist does what he does. It is only the superbly choreographed action sequences and the larger-than-life visual effects that keep the viewers hooked on to the big screen. The climax is stretched beyond limit and the editing sometimes looks patchy. Apart from Rajinikanth, Akshay Kumar, the VFXs, the CGIs and the well-executed screenplay, there is hardly anything worth noticing in the two and a half hour long social drama. Not every time can one win with his good-wins-over-evil plot line, after all! So, all said and done, ‘2.0’ is a visual treat, along with a lot of technical mumbo-jumbo, which is strictly a one-time watch.